Next month marks We Should Cocoa’s 8th anniversary. It seems a fitting time to say goodbye to this monthly chocolate extravaganza which has seen so many gorgeous and mouthwatering chocolate recipes over the years. So let’s make this last one a round-up to remember. 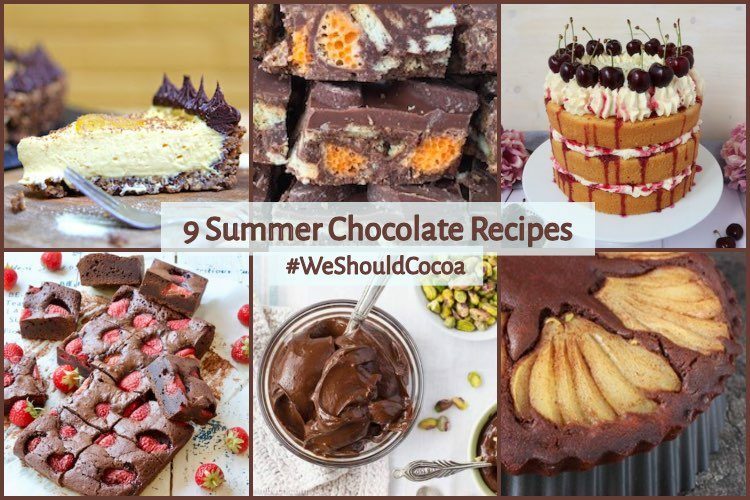 If you’ve ever been part of the #WeShouldCocoa community or even if you’ve not yet taken part, please join in with the ultimate chocolate celebration to be published on 1st September. If you’d like to join in with the final #WeShouldCocoa, scroll down to the bottom of the post and you’ll find the link-up. If you haven’t joined in before or need a reminder, you can find the guidelines on the We Should Cocoa page. 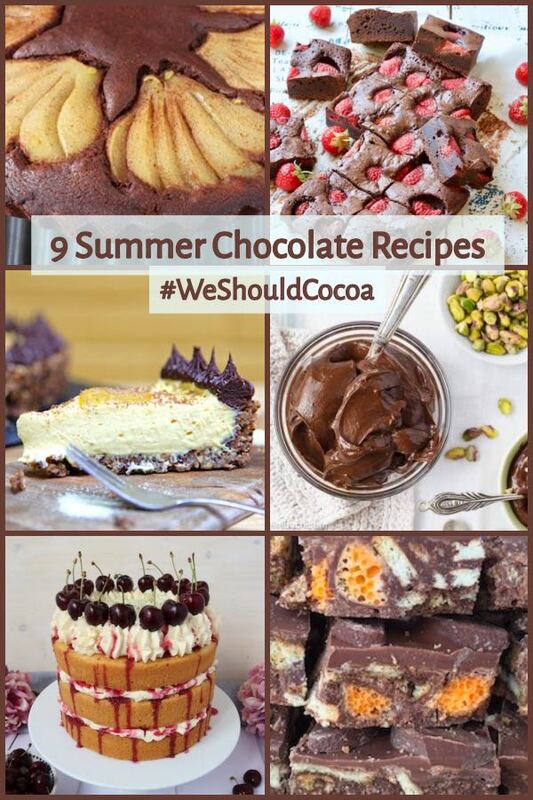 Don’t forget we also have a splendid We Should Cocoa pinterest board featuring many of the recipes that have been shared with #WeShouldCocoa. It’s well worth a look and a great place to find chocolate recipe inspiration. 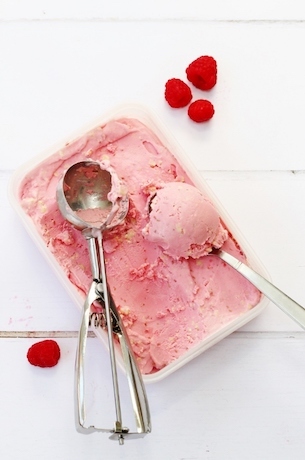 Salad and ice cream are pretty much all I’ve been wanting to eat this summer, so this raspberry and white chocolate ice cream from Searching for Spice has my name written all over it. expect I’m not the only one. Raspberries and white chocolate are a fabulous combination and who can resist ice-cream when it’s so hot and sticky out there? 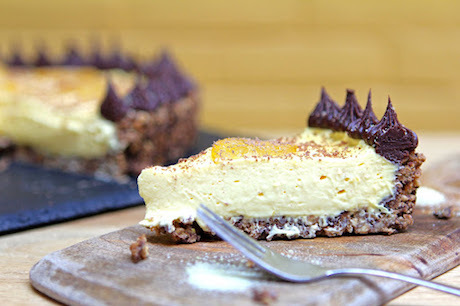 This no-bake lemon, ginger & dark chocolate tart from The Gluten Free Alchemist looks so delectable I’m dying to sink my teeth into it, even if it’s not ice-cream. Kate describes this gluten-free delight as an explosion of textures and flavours exciting each and every taste bud. 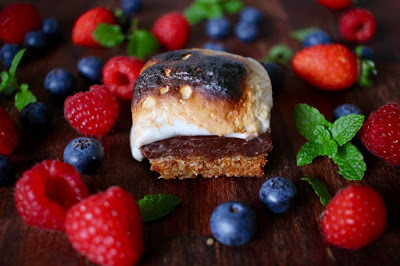 Johanna over at Green Gourmet Giraffe went all out to celebrate American Independence Day with this S’mores slice. She made the graham crackers for the base and vegan marshmallows for the melty but crispy top. With a wedge of chocolate thrown in the middle, these sound heavenly indeed. 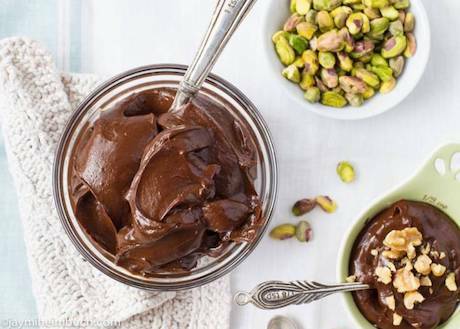 The next no-bake dessert is this vegan chocolate avocado pudding from Bryony – Perfectly Imperfect Mama. It looks really decadent, but is in fact relatively healthy. My contribution to our 9 summer chocolate recipes are these coffee chocolate chip cookies with cardamom. They’re made with ethical chocolate flavoured with coffee beans and cardamom, another great combination of flavours. We had a brief drop in temperature so I hot-footed it to the kitchen and braved the oven. I’m glad I did. It’s not just me that’s braved a bit of baking. 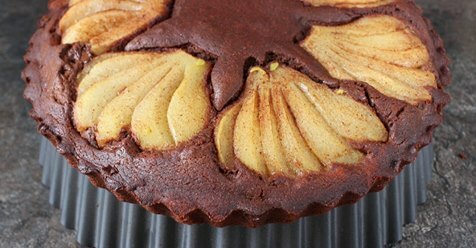 This double chocolate cake with spiced pears from The Foodie Journey looks delicious and is perfect comfort food. Turns out Sylvie is in Australia, so it’s actually winter there. I reckon I could probably force a slice down despite the heat. As many of you will know, I have a thing for chocolate tiffin. Apart from anything else, it’s a good one for summer as it’s no-bake and can be kept in the fridge. This no bake chocolate orange traybake comes from Something Sweet Something Savoury and it looks delicious. 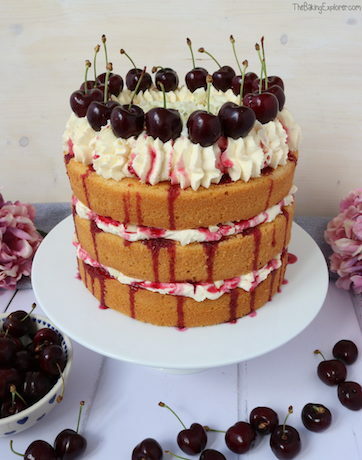 Move over black forest gateau and make way for this white forest cake from The Baking Explorer. Doesn’t it look glorious? I adore cherries and they just sing summer. Accompanying your brownies with some summer berries is a wonderful thing to do, but how about adding them to your brownies? 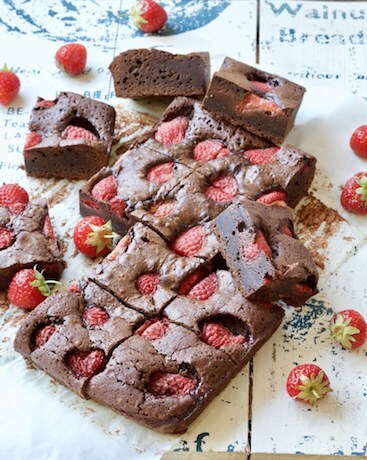 That’s what’s been happening over at Jo’s Kitchen Larder with these chocolate brownies with strawberries. 9 Summer Chocolate Recipes. PIN IT. Such a yummy chocolate summer! That white forest cake looks stunning. It really does look good Angie and cherries are such a glorious summer delight. Such a lovely round up and so tempting! I know I don’t manage to join in every month but I will miss it. I wasn’t planning any new recipes this month but I will make an effort now and try to join in, even if it just gives me an excuse to remake and republish one of my old chocolate recipes! Yay, sounds like a plan Corina. I’m feeling a bit sad about it, eight years is a long time, but it also feels as though it’s run its course. Oh no – I am so sad to hear you are winding up the event but you have done an amazing job to keep it going so long. These chocolate treats look great. I am now planning some chocolate treats for this month to send off WSC in style. Hooray Johanna. You’ve been a major part of WSC for so long. It’s been good fun and I’m feeling a bit sad too, but it also feels time to let go. Oh what a shame…..let’s make sure it goes out with a bang!!! !Thankyou for all your hard work.I will be linking up for a last hurrah! I look forward to your entry and thank you for sharing so many of your recipes. I’m hoping for a good turn out for this last #WeShouldCocoa chocolate party. So sad to see We Should Cocoa ending! I hope I can link up with the last one! Oh, I hope so too Kat. You’ve been linking up for years, it would be good to have you on board for the final one. Thanks Jacqui. The good thing about #WeShouldCocoa is that it will always be there. Many of the posts from the early days right up to the present are still being looked at and the various links followed. Hooray Angela. I’m really please as you’ve been joining in with #WeshouldCocoa for a long time now. We Should Cocoa has been the fine home for a treasure trove of delicious, chocolatey recipes over the years and I’m very grateful that you’ve kept it alive for so long. For old times’ sake I’ll do my very, very best to drag one last chocolate recipe out of my foggy brain. Oh yes, please do Phil. That would be fantastic. Those eight years have sped by so fast, haven’t they? SO MUCH chocolate deliciousness across those years! They really have Kavey. It’s been one big chocolatey blast. Hope you’ll join in for this final anniversary edition. Thanks Jo. Glad to have you on board. And yes, it is sad, but all good things ….! I’m sad to see this linky go as I’ve enjoyed adding my chocolate recipes as well as looking at everyone else’s! Glad I have finally made a chocolate recipe which I can link up in time to join the last chocolate extravaganza! Lovely to have you join in for the final #WeShouldCocoa Cat. Always look forward to your entries. Sad to say goodbye to We Should Cocoa. 8 Years has passed so quickly. Haven’t joined in for a while, but have always looked at the monthly entries and drooled over the gorgeous chocolate delights. Am joining in for the final challenge, and that you Choclette for all your hard work. How lovely to have you on board for the final chocolate party Snowy. This really is the end of a blogging era. I haven’t had time to play We Should Cocoa for a long time, but had to do so for the final time. It’s been such a pleasure joining you over the years with the chocolate challenges and it’s pushed me to develop some recipes that I would never have made. So thank you for all the fun over the years. Thanks Janice and thank you too for being a part of it for so very long. It’s been fun, but no-one seems to have time any more to take part in challenges. It’s sad, but it feels like the right time to let go. So sad this is ending, but glad I could be part of the final one! Thanks for joining in one last time Kat and for being a part of it for so long. I didn’t know it was such a well kept secret Tandy. I shall miss it after eight years, but it’s also time to say goodbye. It’s unlikely I’ll be starting up anything new, but if I do I’ll let you know. Even though i have not participated as much in recent years, I genuinely am sad to learn that WSC is coming to an end. You truly have been a stellar host and I am so amazed to learn it is eight years old. Even though I don’t eat chocoalte much, the archive of chocolate recipes you have will continue to be a source of inspiration. It is a pleasure to be joining in for the last time and thank you for letting me know so that I could be part of its ‘farewell’ party. Thank you Shaheen and I’m so glad to have you on board for the final chocolate party. Despite you’re only partial tolerance to chocolate, you’ve entered some fabulous recipes over the years.